Aussie architect and internet entrepreneur Nic Granleese, did his interview with us during his last visit in Toronto. 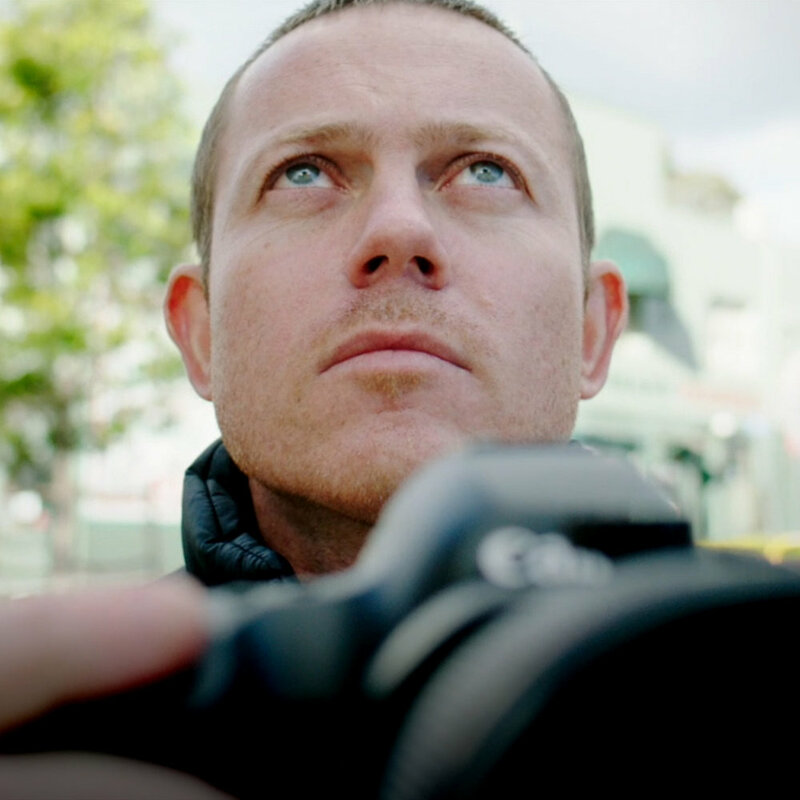 He talked about his shoeless upbringing in rural Australia and how during a sabbatical early on in his career, he decided to hop on his motorcycle, quit architecture and become a photographer. Subsequently, his path led him to create bowerbird, a growing online platform that links architects with publications. Listen in to hear Nic speak about his path. A report on lessons learned from a Giaimo x rvltr instagram takeover. Back in February this year, I visited the Arc et Senans Royal Saltworks in the Franche-comte region of France. The complex was designed by Claude-Nicolas Ledoux in the late 18th century. It was intended as a salt processing facility for briny spring waters from the surroundings. The complex was designed hierarchically in a semi-circular plan that was to form part of a larger city imagined by Ledoux, plan that never fully came about. It was completed at a time where traditional, labour and ressource-intensive means of production were starting to be replaced by thanks to the nascent industrial revolution, which made the saltworks obsolete almost from the beginning. It never produced to the extent it was supposed to and about 100 year after opening, salt production permanently ceased, not being able to compete with cheaper sea salt brought by rail. Nonetheless, Ledoux designed a very innovative complex for the time, rationalizing the organization of the salt production, housing all the workers on-site, essentially forming a self-contained community. Indeed, salt was then a very coveted commodity as it was used to preserve food and was heavily taxed by the Ferme générale. Housing all workers on-site was a way to control production and prevent the smuggling of salt outside of the facility. Of note, at the Maison du directeur, are several architectural features that separate the building from the rest of the complex, to show its importance. The columns are made of square and cylindrical sections which create very photogenic shadow plays. The central location, unique architectural feature and the oversized oculus in the pediment makes it crystal clear how important is that building to the plan. Ledoux’s legacy ended up being mostly made of unbuilt projects, the saltworks being on of the few built projects that still stand to this day and allows us to see how ahead of his time he was. Au mois de Février 2015, j’ai eu l’occasion de visiter la Saline Royale d’Arc et Senans, dans la region Franche-Comté. L’ensemble conçu par Claude-Nicolas Ledoux au 18eme siècle fut â l'origine une usine de production de sel, utilisant les sources saumâtres locales pour en extraire cette substance très précieuse. Le projet a été conçu suivant un plan semi-circulaire ou toutes les fonctions sont hiérarchisées et placées en fonction de leur importance. Il fut conçu a l’origine comme faisant partie d’une ville conçue par Ledoux qui ne fut jamais complétée. Le complexe incorporait des méthodes de production proto-industrielles qui furent mises en place un peu trop tard, la revolution industrielle ayant commencé peu de temps après, ce qui rendit les salines obsolètes des le depart. La saline ne produisit jamais autant que prévu et fût fermée tout juste 100 ans après sa creation, la concurrence avec le sel de mer, livré par chemin de fer, étant trop forte. Ledoux néanmoins conçût un ensemble innovant pour son époque, rationalisant la production de sel, incluant des logements pour les ouvriers sur site pour créer une forme de commune autarcique. Le sel étant un denrée très convoitée a l’époque pour la preservation de la nourriture, il était logique de protéger les revenus de la Gabelle de la Ferme Générale en contrôlant l’accès à la saline et en limitant les allées et venues des ouvriers. A noter, la maison du directeur qui occupe la place centrale de la Saline, comporte des éléments architecturaux qui la distingue du reste, tels que les colonnes a sections carrées et ronde ainsi que l’oculus démesuré au milieu du frontispice, mettent en evidence l’importance de cet edifice par rapport au reste du complexe. L’heritage de Ledoux reste composé principalement de projets non-construits, la saline étant un des rares complexes qu’il a pu voir bâti. Après la chute de l’ancien regime, Ledoux se concentra sur la conception de villes idéales et de projets spéculatifs, car ayant été un architecte disposant des faveur du roi, il sombra dans l’obscurité, jusqu’a ce qu’il fut redécouvert bien plus tard, au vingtième siècle. Covered porch of a production building | Colonnade d'un bâtiment de production. Ce projet d’extension d’un Lycee a Pontcharra, pres de Grenoble, consiste en l’addition de 14 salles de classes sur un niveau RDC. Les 4 batiments sont en bois modulaire 3D installes en forme de “U" atour d’un jardin des poetes. Cette typologie caractérise l’ambience introvertie et apaisée du lieu, créant un environement propice a l’enseignement. Le cote simple et sans prétention du complexe est très appreciable, ou la qualité de l’experience des usagers prend le pas sur les gestes architecturaux. C’est un projet élégant par sa simplicite et son efficacité, sans fioritures. La toiture metallique apporte une touche d’elegance et permet d’augmenter la durée de vie des bâtiments, tout en améliorant le confort d’été et réduisant la consommation énergétique. Les larges ouvertures contribuent à la qualité des intérieurs par leur abondant apport en lumière naturelle, ainsi qu’à la transparence des bâtiments qui confère a l’ensemble une impression d’ouverture, très a propos pour des bâtiments scolaires. J’ai pris beaucoup de plaisir a photographier ces lieux, d’une part car c’est un project architecturalement intéressant et d’autre part car le cadre montagnard est absolument magnifique. révélateur had the privilege to shoot this extension for a high-school in Pontcharra, near Grenoble, France. The four buildings comprise 14 classrooms on one level, a "poet garden" courtyard and are prefabricated wood structure, manufactured in a plant and assembled and finished on-site. The unpretentious atmosphere is very pleasant, as it is the user experience that takes precedence over grandiose architectural gestures. It is an elegant project du to its simplicity, functionality and well-chosen materials. The steel roof, though not functionally indispensable, brings visual elegance to the ensemble and summer comfort as am oversized sunshade that contributes to reducing the energy footprint of the building. 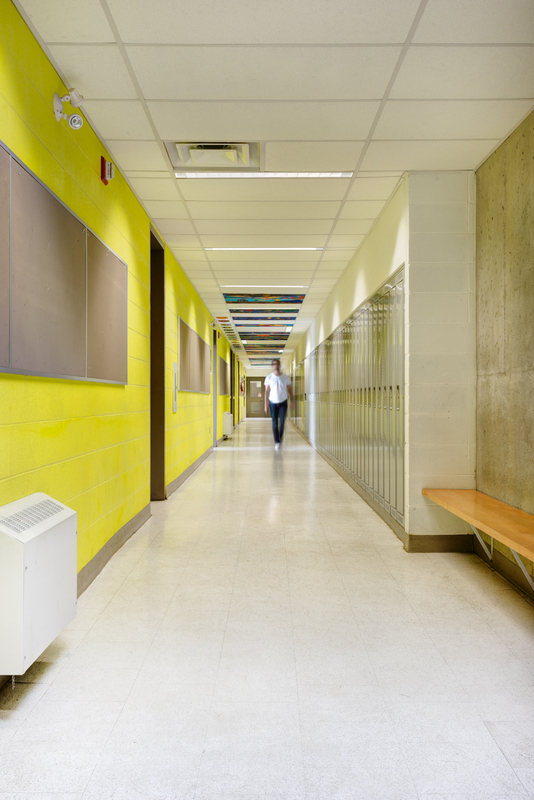 The oversized windows contribute to the feeling of transparency, literally and figuratively, which is perfectly appropriate for an educational building. I truly enjoyed shooting this project as it is both architecturally competent as well as set in a mountainous landscape that provides the perfect backdrop. Our shoot of the Buckingham Arena by WGD Architects was featured in a recent issue of Award magazine. The article covers the story of the PPP process the various stakeholders had to go through in order make this project a success. Read full story below. Earlier this summer révélateur shot the brand new Buckingham Arena in Downsview Park, Toronto. This was an interesting challenge for us as we had never shot this type of facility before. WGD Architects designed a four-rink arena for local leagues and events. Based on our scouting shoot, our studio was commissioned to take 10 images of the project. We had our eyes open for the money shots and luckily, the cool, somewhat industrial and utilitarian aesthetic of the building lent itself well to getting great shots. We set out to shoot at the end of the day as we knew this was when the arena was going to be the busiest, giving us plenty of opportunities to introduce the human element in our images. Without people, such a large building would end up looking very empty and cavernous. Lucky for us, there were hockey games going on during our shoot so we seized the opportunity to include some motion to the rink photographs by shooting additional frames a slow speeds so we would get the proverbial motion blur that makes architectural shots much more dynamic and is particularly fitting to shooting a hockey arena. We learned a lot from this shoot as we were given minimal instructions from the client and had the opportunity to explore some more creative angles, some of which ended up being picked by the architect. We later on shot another arena for the same client that will be featured here in the coming weeks. Earlier this summer, Revelateur was commissioned to shoot DTAH's little trinity project. This is constitutes a good example of adaptive reuse in the city of toronto. This was a fun shoot as it was all about showcasing the interplay between the old and the new. Facade on King St. East (at Parliament). "The Little Trinity Church community, founded in 1844 near the corner of King Street East and Parliament Streets in Toronto, developed a building expansion study to investigate the renovation and redevelopment of the three buildings on their site to maximize community worship, social services, and recreational uses in response to the future West Don Lands development immediately south of their property. Back of building from garden. 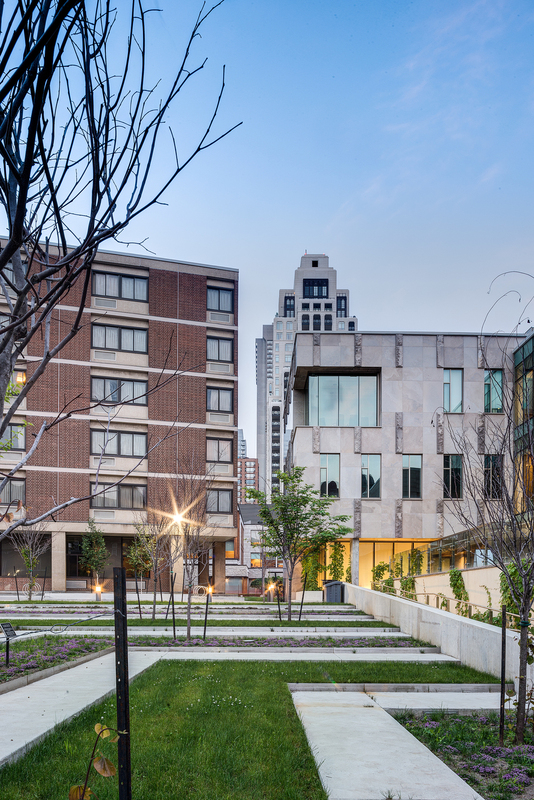 DTAH redeveloped the derelict 19th century townhouses at 399 King Street into the Little Trinity Annex, a new administrative centre and multi-purpose hall for the church community. Renovations in the school house building included the basement multi-purpose hall and ground floor child care spaces to maximize Sunday School capacity and functionality." Although a small project, it was a fun shoot as adaptive reuse presents challenges that are not necessarily evident when shooting other kinds of projects. This is post 10 of 10, in a series detailing important aspects to hiring an architectural photographer while avoiding the most common pitfalls. 10. DO IT RIGHT THE FIRST TIME. Some shoots will require specific equipment and skills to be done properly. Do not skimp out on the expense if it gives you the images you need. Equipment rental and consultants are sometimes necessary to get the job done well. You photographer will be able to make appropriate recommendations. This is post 9 of a series of 10, in a series detailing important aspects to hiring an architectural photographer while avoiding the most common pitfalls. 9. CHOOSE EXCELLENT CUSTOMER SERVICE. Professionalism prevents a lot of headaches. It is often said that the first impression says a lot about a person. Make sure your photographer cares about your needs in more than just words. Their attitude, attentiveness and professionalism should show in everything they do. Make your life easier by choosing someone you can rely on. Buckingham Arena, WGD Architects, Toronto. This is post 8 of a series of 10, in a series detailing important aspects to hiring an architectural photographer while avoiding the most common pitfalls. Your photographer should know how to deal with these factors (seasons, weather and time of day) in order to take the best shots at the ideal time. Factor in weather and allow for contingency plans. Architectural photography is particularly subject to weather, especially when shooting exteriors. When planning a shoot, ask if your photographer has a contingency plan in the case of bad weather - and do not hesitate to reschedule. If images are shot in poor weather, you risk having to re-shoot the project at additional expense if the quality is negatively affected. Ask your photographer to supply you with a site prep checklist. There is a lot more going into preparing the site for photography than just cleaning up. In order to get the best looking shots, ask your photographer to make recommendations for staging the images. This is post 7 of a series of 10, in a series detailing important aspects to hiring an architectural photographer while avoiding the most common pitfalls. 7. GIVE CREDIT WHERE IT’S DUE. Mutually beneficial relationships are best for all parties involved and crediting your photographer whenever you use their images is more than a mere contractual requirement, it is an ethical thing to do. They should also credit you, the client, on their online and offline marketing material. Do not hesitate to ask them to do so should they not offer it from the get-go (it can also be a contractual agreement). This is post 6 of a series of 10, in a series detailing important aspects to hiring an architectural photographer while avoiding the most common pitfalls. 1. Shop locally if you can. By avoiding travel expenses, you save money and promote the local economy. 2. Bundle shoots together. If you can combine several projects to be shot at the same time, your photographer should be able to give you a better deal. 3. Use fewer and better views. Carefully consider the shots you need in order to save money. If unsure, your photographer will have a good idea of what shots will best tell the story of your project. Ask them to make recommendations. 4. Keep the bottom line in mind. How much money are you likely to make with these images? How many projects can they help you win? We recently had the pleasure to shoot the new Goldring student center at Victoria college on the University of Toronto campus. Our assignment was to explore the relationship of this new project to its surroundings and emphasize the contextual importance of all the buildings one can see in this dense urban environment. The student center is surrounded by exceptional buildings such as the Isabel Bader theater (Lett/Smith), McKinsey building (Hariri Pontarini Architects) and the Gardiner museum (KPMB) among many others. Working with context as the main idea driving this shoot, it really opened our eyes the relationship this building has with its surroundings. This is one of the main motivations behind moriyama and Teshima's work and we had a lot of fun working at making this evident in our photographs. Hopefully our readers are able to get a better understanding of the project from an urban perspective and we would love to hear your thoughts in the comments section.